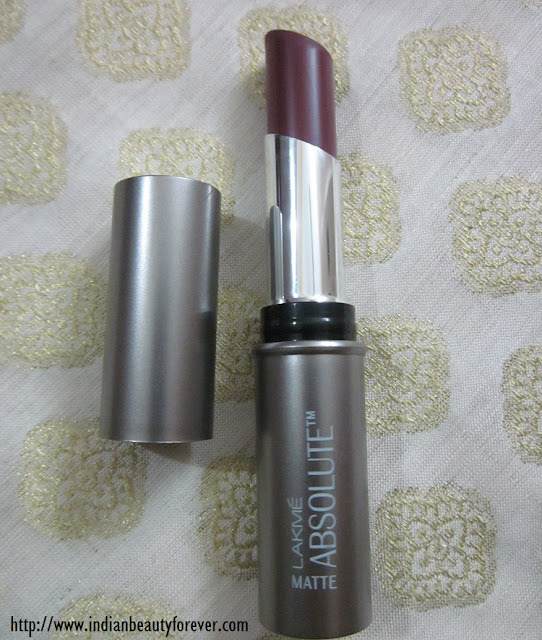 It’s been long time since Lakme Absolute range was launched and I got this Lakme Absolute Lipstick in Brilliant kiss about 3 months ago but swatches and review was delayed as I have not used this color a lot which made me forget about this completely though I have taken the pictures on the very same day I got it. 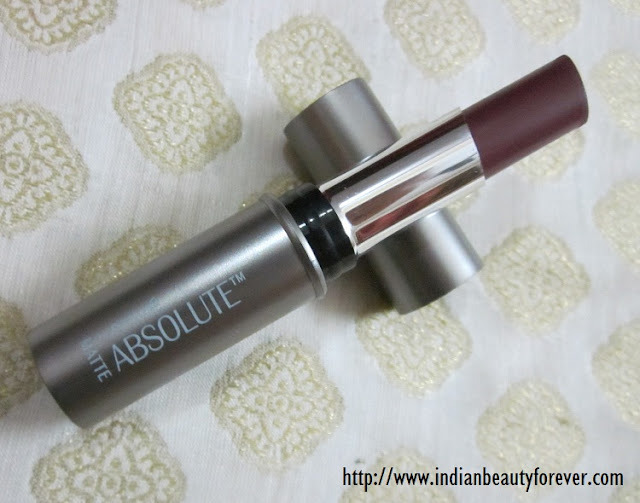 :D So, Today, I will be reviewing Brilliant Kiss from Lakme Absolute range. Company claims- Discover the finish of a matte with unbelievable comfort. This rich color matte stick is enriched with Vitamin E and Wheat Germ Oil to keep lips silky, soft and smooth. 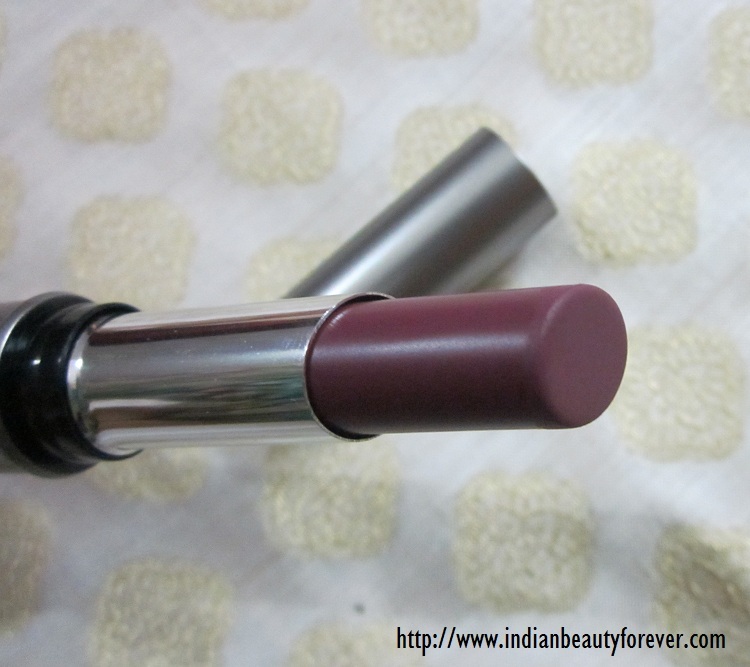 It is non-drying creamy yet matte finish with this rich lip color. 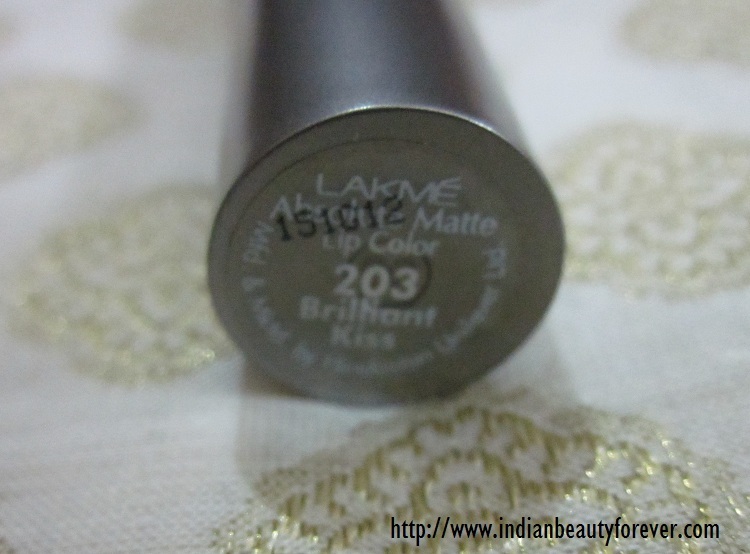 My Experience- This is my first purchase from the Lakme absolute matte lipsticks or lip color and I really liked its packaging, it is nice!! It has a matte steel grey body. This color Brilliant kiss is a warm plumy purple color or in short magenta, :) which is definitely not my type but that does not make it a bad shade. Indeed it is very beautiful, with a creamy matte formula that doesn't dry out the lips. With this on you won't even feel the need to use a lip balm before wearing this. It has a flat top which is fine but I prefer pointed bullet more which makes the application easier and precise. I won't be lying if I say that I had high expectation with this range of lipsticks but now, that I hae used this, I find myself disappointed!!! No doubt! Packaging is great and looks classy but those things can't compensate when the actual product is not worth the price tag. Did I mention that, the pigmentation and the sheer formula makes it low on staying power. yup that's true!! It isn't good in terms of staying power though doesn't stain but can be wiped off within 2 hours with literally no traces behind to claim its existence. If I would have got it in peach carnation or winter lily which are warmer than this shade then that would be still better since that would be somehow mixed with my actual lip color in a way that the unevenness is not much visible. Some of you might like the sheer pigmentation which does not feel heavy on the lips but in that case you can try some other range cheaper than this and the same sheerness. No issues with the availability, it is easily available everywhere with Lakme being a popular Desi brand. Packaging is no doubt looks great and classy. It's matte steel grey body does look beautiful. It has a creamy matte texture, due to which it doesn't settle in the fine lines and you won't need a balm. Bullet is sturdy and not delicate to break easily, it would have been better if the bullet would have been pointed instead of flat top. It isn't pigmented enough to deliver that rich and opaque color. Uneven application (Check the swatches). Price is high for its sheer pigmentation, low staying power and beautiful packaging. Could have been less or the actual product could have been better and pigmented. It is low on staying power. 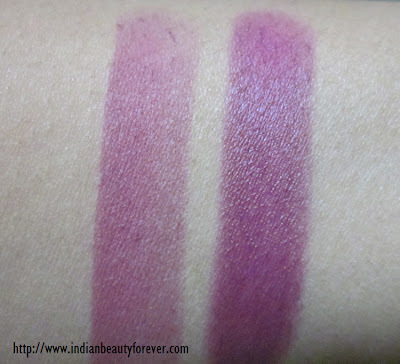 Right Puja, 395 rs for that pigmentation, not worth..
Nice shade, but its looking more purplish...I swatched it, it seemed magenta..I want the classic rose shade..
Nice shade ....I want to buy the classic rose from this range..
so sheer? then i wouldnt be buying it! it doesnt seems worth the price! Yes Shourima, it is not worth the money. even streetwear is more pigmented then this! Main bhi, not a fan of sheer lip colors, i like rich in texture and pigmentation colors that can not only hide the pigmentation but can also make the actual color show up on the lips in a single swipe. Aw thats too bad you dont love it, I think it's quite a lovely color actually. I'm good with sheer colors, I guess its easier to wear! It indeed is a lovely color but Sharlynn it is pricey for that pigmentation. ahh..i was thinking from their hyped market that they would come out as winners..
thanks for the review..i will not look at them now.. Indeed Demi. :) I would have been happy if the same thing i could get for around 300.
but a lot of women like such shades a lot and can carry them very well.